Had a full day with clients on our landscape photo course based in Berwick. No camera with me today so that I could give my full attention to the group. We started in Berwick with bridges and a few town shots, then up behind the old barracks. Nice light. Eyemouth was next and was good at all locations. Lots of working boats, sunshine and a few reflections. Then pictures of a seal being fed fish in the harbour entrance. This was followed by catching waves crashing against the sea wall. Lunch was in the Contented Sole with a pint of Speckled Hen. After lunch it was down to the rocks near the mouth of the harbour for the waves and patterns. 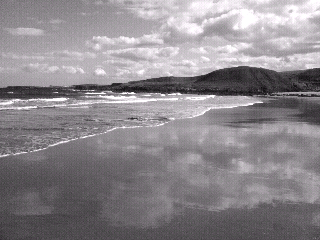 Next was down to Coldingham Bay. Here it was great for patterns in the sand, reflections of the clouds on the wet sand wall(see photo), waves and a rider on a horse riding through the sea. We ended the day at Spittal Point opposite Berwick lighthouse and breakwater. Nice light and tide still going out but didn’t stop Andrew from misjudging it and getting wet feet. Fortunately Jan caught it for posterity and it will appear on the web site in time!